5 vowel-shaped toys bring hands-on play to 3 free iPad apps created for these toys. Vowel toys make learning to read hands-on and interactive. This toy/app combo puts five vowel letter toys into kids' hands to use with three free apps that teach reading. The first two apps -- Tiggly Story Maker and Tiggly Submarine -- are out now. The third one -- Tiggly Doctor -- is coming later in June. The apps let kids explore word construction, word families, spelling, and rhyming. The toys interact with iPads whenever the child places a vowel on the surface, making these reading games have a hands-on component. The apps have fun themes, including playing doctor, writing plays and songs, and exploring the ocean. The vowel toys work seamlessly with the two apps already released. When kids tap them to the surface of their tablet, something happens. The key to whether this toy is worth its $29.95 investment is the apps. Tiggly Story Maker is a great way to interest kids in words. When my kids were young, we did similar activities, using magnetic letter blocks on our refrigerator. This app makes the creation process so much more fun because of the animations that appear when you succeed at creating a real word. And the ability to create story videos is just icing on this otherwise delicious spelling cake. The Tiggly Submarine app is good, but it isn't as engaging as the Tiggly Storymaker app. Each of the four activities works from an educational perspective, but the repetition gets old quickly. We have seen an early build of the Tiggly Doctor app and so far we are impressed. We will update the rating of this tech toy review, once the Tiggly Doctor app releases. Tiggly Words is a fun toy to get young children interested in learning words. The physical component brings your child into the learning experiences in a hands-on way. Choose this tech toy for kids who are tactile and have trouble sitting still. The toys give them something to entice them into the learning experience. 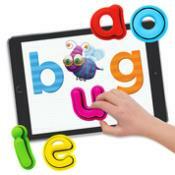 This Tiggly Words tech toy review was written by Jinny Gudmundsen.